This is a post about a grocery store, but it is also about how I have changed. 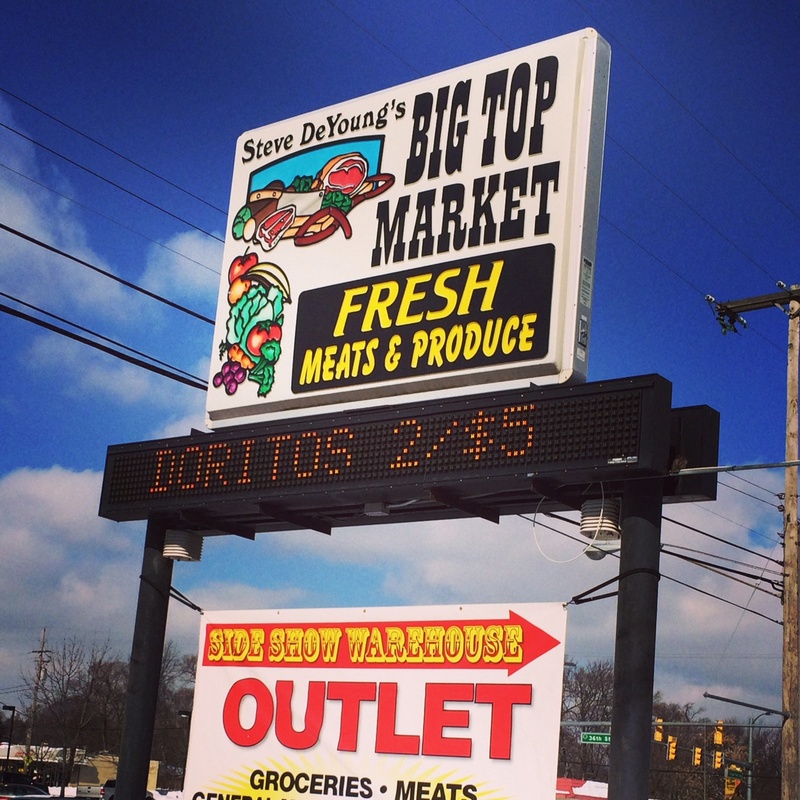 The grocery store is Steve DeYoung’s Big Top Market on Clyde Park. The Big Top has intrigued me since I was kid. My aunt lives in that part of town and every time my parents drove by, it caught my eye. As a kid, it seemed magical – a grocery store that looks like a circus! Until recently, I’ve never had the opportunity to stop in, but a few weeks ago I was heading out to see my aunt and had a few extra minutes. I also was in need of a couple of groceries, so for the first time, I went into the Big Top. One of the things, other than the circus decor, that sets the Big Top Market apart from other grocery stores is the amazing meat market. It’s a 100 foot long counter, with every available cut and selection of meat you could dream of. It’s amazing – a carnivore’s paradise. Besides what you might find in a typical store, I also saw hooves, hearts, individual fish tails, chicken feet and other delicacies for sale. I had heard about their meat market from foodie friends, but it’s something to behold for yourself. Should you have questions, behind that magic counter is a staff of butchers that seem to know everything there is to know about meat. There is a reason I fell in love with the Big Top Market. About a year ago I decided to try to get a little more healthy. I made some changes to my diet; nothing too severe – I try to eat a little more local, a little more seasonal, and a little more sustainable. I eat a lot more meat, fruits, vegetables and whole foods and I try to eat fewer things with ingredients I can’t pronounce. As I made this change in my diet, I started shopping differently. I buy more from farmer’s markets, the West Michigan COOP, and smaller speciality stores. When I do go to a traditional grocery store, more and more I find myself only using the outside edges of the store. As the year has progressed, I’ve stopped wanting to go to big “everything and anything” stores. Three quarters of the food they carry isn’t anything I’ll eat anymore, but it is all still clamoring for my attention. It’s overwhelming and annoying. The beef shanks? They were delicious. I should make an effort to go there more. I should add it to my list when I run around to all of the ethnic groceries that are not in my normal stomping grounds. I do love that place! That’s exactly what happened, Catie! I went down Division to hit my favorite ethic shops, then cut over on 36th to Clyde Park. Love it!